^ a b c "Ken Aston - the inventor of yellow and red cards". fifa.com. Retrieved February 20, 2013. ^ a b United States Soccer Federation Inc.,; Michael Lewis (2000). Soccer for dummies. Foster City, CA: IDG Books Worldwide. ISBN 1118053575. Retrieved 2014-06-05. ^ "Law 5 - The Referee". Laws of the Game 2017-18. Zurich: International Football Association Board. 2017-05-22. pp. 61–67. Retrieved 2017-11-18. ^ "Practical Guidelines for Match Officials". Laws of the Game 2017-18. Zurich: International Football Association Board. 2017-05-22. pp. 173–202. Retrieved 2017-11-18. 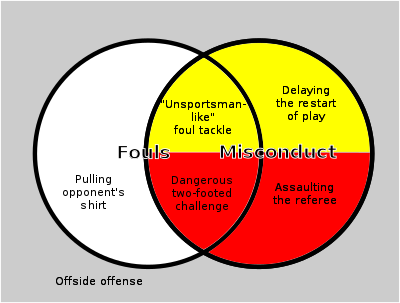 ^ "Law 12 - Fouls and Misconduct". Laws of the Game 2017-18. Zurich: International Football Association Board. 2017-05-22. pp. 96–105. Retrieved 2017-11-18.